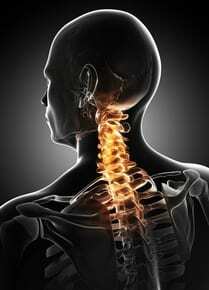 Cervical fusion is a surgical procedure performed to join at least two of the vertebrae of the neck. This surgery is performed to alleviate pain in patients with disorders of the cervical spine, such as stenosis and degenerative disc disease. The cervical spine is made up of seven vertebrae stacked on top of one other, each two separated by a cushion known as an intervertebral disc. In patients with certain spine conditions, some bones of the cervical spine may rub against one other, causing pain, numbness and other troubling symptoms. While there are several nonsurgical methods available to treat these conditions, some patients may benefit from cervical fusion to avoid future complications and achieve long-term relief. In addition to relieving pain, a cervical fusion may be performed to realign the spine correctly or to prevent destabilization, further deterioration, fracture or paralysis. tituted for bone grafts in other spinal fusions, they are not used in cervical procedures. This is because there is a risk of adverse reactions to the BMPs that may result in difficulty swallowing or breathing. Titanium metal screws or a titanium metal cage are most often used to stabilize the region until the bones grow together. Fusion surgery is performed under general anesthesia in a hospital setting. Movement of the spine in the treated area will not be possible after surgery, so the operation is usually only performed on one small section of the cervical spine. New technology allows spinal fusion to be performed with magnification and illumination of the damaged area. Instead of stripping away the muscle, the surgeon can insert an endoscope through a much smaller incision, effectively creating a tunnel directly to the affected vertebrae. This modern procedure is much less invasive than previous operations and results in less scarring, less bleeding and a more rapid recovery. "The best orthopedic neurosurgeon I have had the good fortune to find! I would never go anywhere but Hospital for Special Surgery or Dr.Girardi again!" -R.U. Although considered a safe procedure, cervical fusion carries some risks as do all surgeries. These include the possibilities of infection, excessive bleeding, nerve damage, grafting problems, breathing difficulties and adverse reactions to medications or anesthesia. After the cervical fusion procedure, patients stay in the hospital for up to a week, but are encouraged to get up and walk around as soon as they are able. A rigid neck brace may need to be worn for several months after surgery, depending on whether or not metal hardware has been used during the operation. Patients will require physical therapy after surgery in order to restore strength and mobility to the area. Physical therapy is designed to control pain and inflammation throughout the often lengthy recovery process, and may include massage, electrical stimulation and ice, as well as physical exercise. Throughout the rehabilitation process, patients gradually increase activity levels and learn new methods of movement to keep themselves as flexible as possible. Heavy lifting and other types of strenuous activities are restricted until healing is completed, usually a period of several months. Patients will be individually advised about when they may resume normal daily activities, depending on the nature of their particular surgical surgery, their medical condition, and the speed at which they are healing.